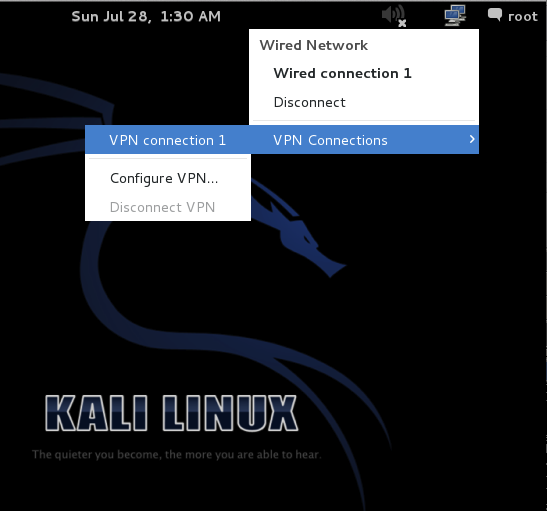 Virtual Private Networks are very useful, so remote users can connect to a LAN as if they were in the building. This is not the most secure VPN possible--I think it's using PPTP (although it's very hard to find out!). However, the weakest link in a VPN is usually your password. In the right pane, click "Add Roles". In the "Before You Begin" screen, click Next. 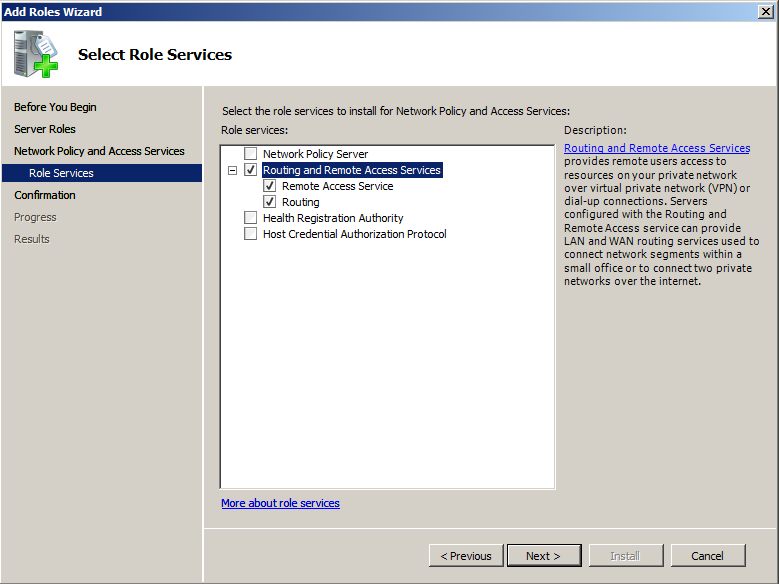 In the "Select Server Roles" screen, check the "Network Policy and Access Services" role, as shown below, and then click Next. 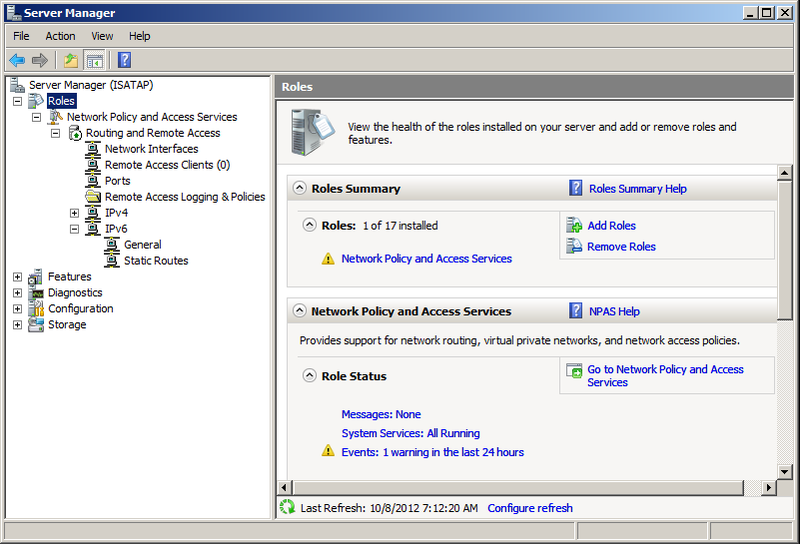 In the "Introduction to Network Policy and Access Services" screen, click Next. 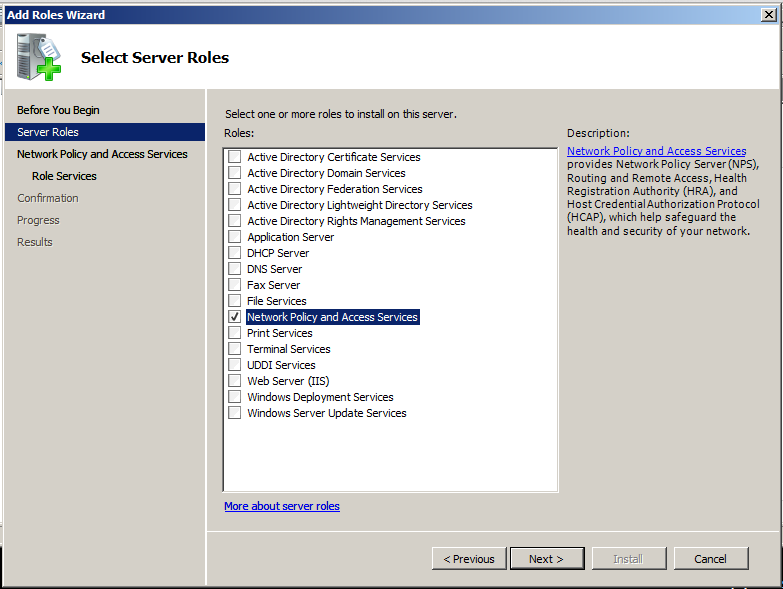 In the "Select Role Services" screen, check "Routing and Remote Access Services", as shown below, and then click Next. In the "Confirm Installation Selection" screen, click Install. When you see the "Installation succeeded" message, click Close. 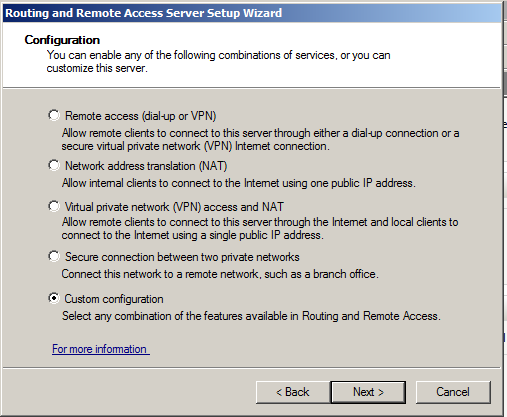 In the left pane of "Server Manager", right-click on "Routing and Remote Access" and click "Configure and Enable Routing and Remote Access". In the "Welcome to the Routing and Remote Access Server Setup Wizard" screen, click Next. 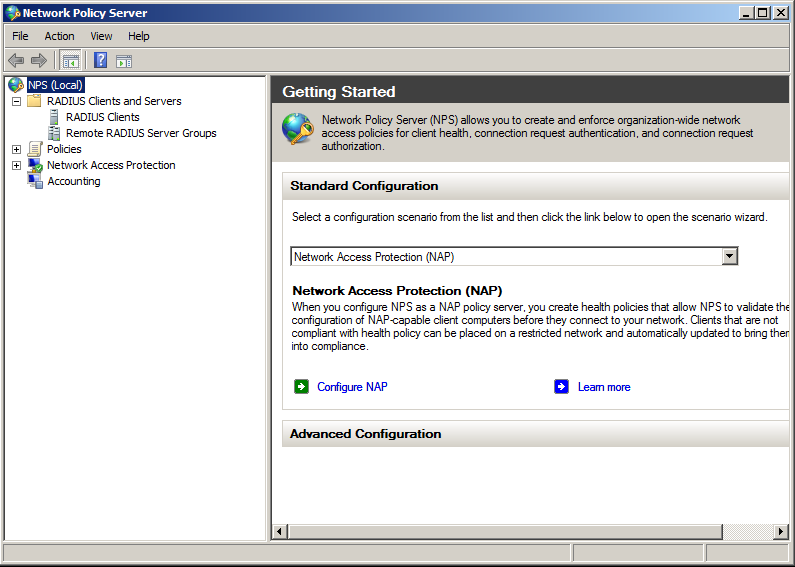 In the "Custom Configuration" screen, click "VPN access, and click Next. In the "Completing the Routing and Remote Access Server Setup Wizard" screen, click Finish. A box pops up saying "Start the service". Click the "Start service" button. On the lower left of the screen, click the little black square icon to open a Command Prompt window. In the Command Prompt window, type IPCONFIG and press Enter. Make a note of your IP address. You need to specify a server that will provide access to your network. This is a RADIUS server. For this example I will use the same server for everything. Click Start, "All Programs", "Administrative Tools", "Network Policy Server". 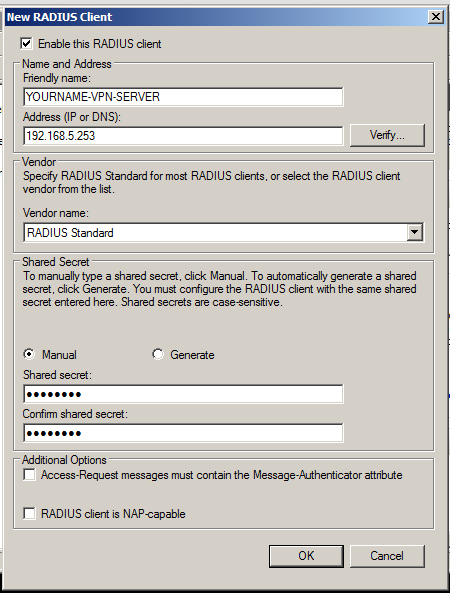 Right click on "RADIUS Clients and click "New RADIUS Client". Friendly name: YOURNAME-VPN-SERVER, replacing "YOURNAME" with your own name. In the "New RADIUS Client" box, click OK. 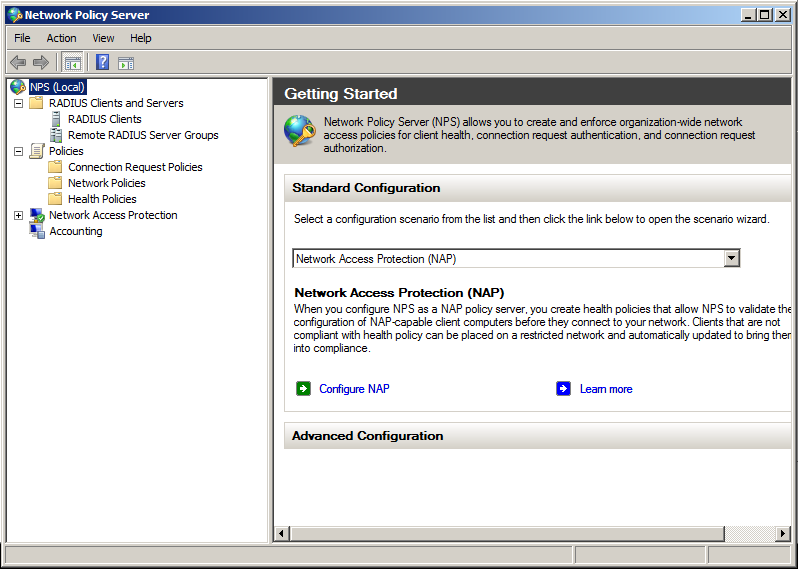 In the left pane of the "Network Policy Server" window, right-click "Network Policies" and click New. 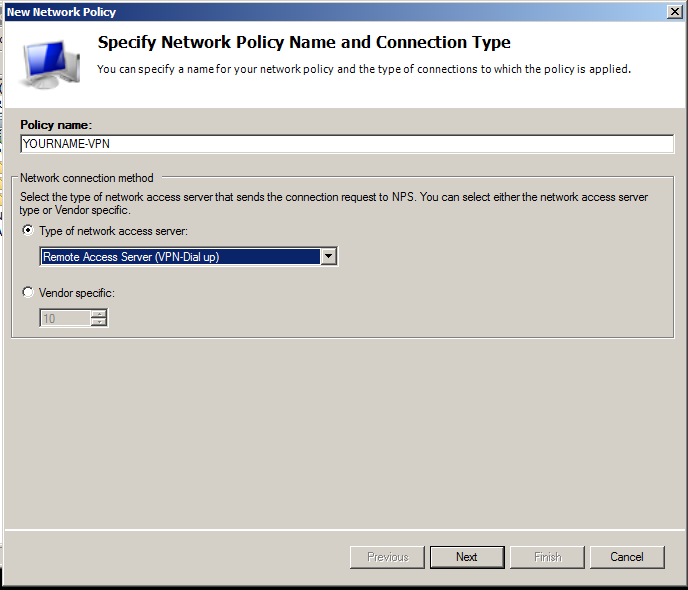 In the "Specify Network Policy Name and Connection Type" box, enter a "Policy Name" of YOURNAME-VPN. 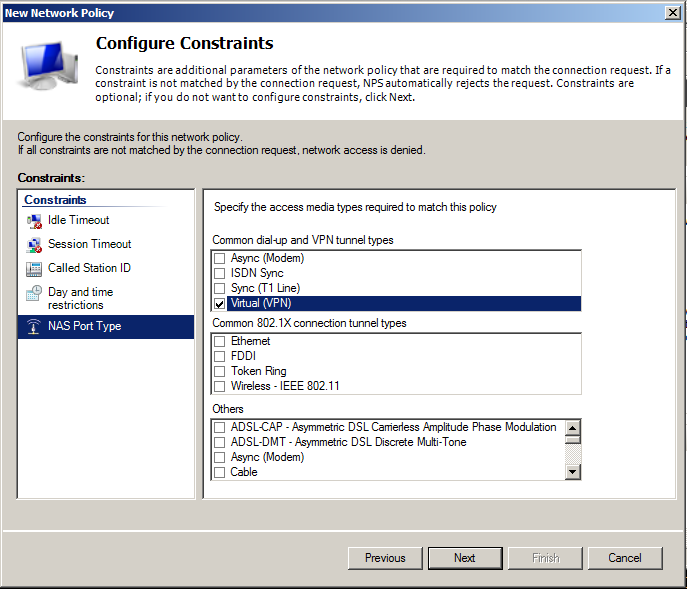 In the "Specify Network Policy Name and Connection Type" box, Click Next. In the "Specify Conditions" box, click Add. In the "User Groups" box, click "Add Groups...". Note: It's better to define a "VPN Users" group, either locally or in Active Directory, and add the authorized accounts to that. I am just allowing all Users in to make the project simpler. In the "Select Group" box, click OK. In the "User Groups" box, click OK. In the "Specify Conditions" box, click Next. In the "Specify Access Permission" box, accept the default selection of "Access granted" and click Next. 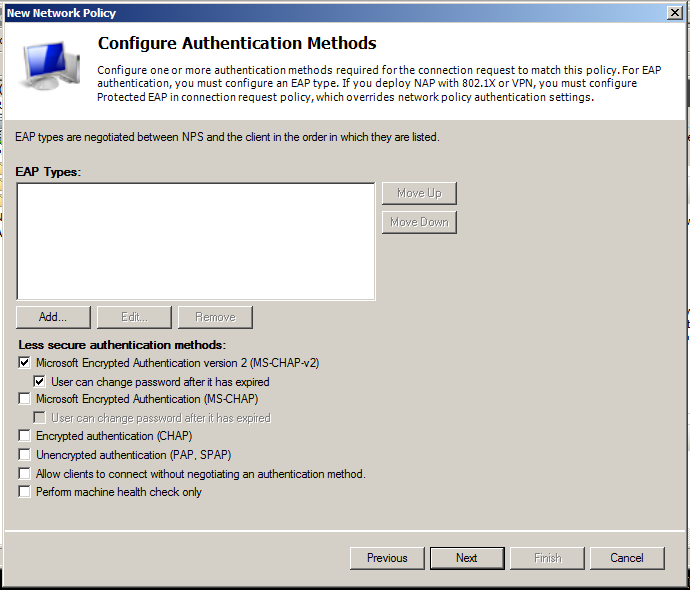 In the "Configure Authentication Methods" box, clear the "Microsoft Encrypted Authentication (MS-CHAP)" box, as shown below, and then click Next. We will allow only the most secure option available, MS-CHAP-v2. In the "Configure Constraints" box, in the left pane, click "NAS Port Type". In the "Configure Constraints" box, click Next. 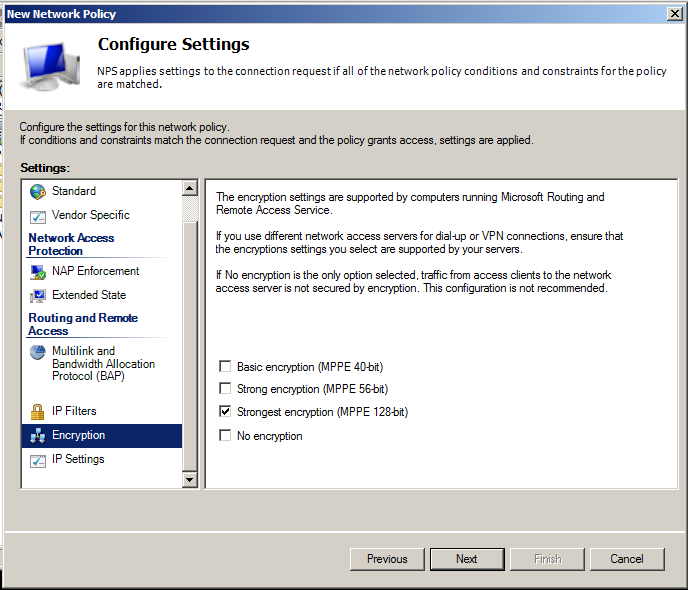 In the "Configure Settings" box, in the left pane, click Encryption. In the right pane, notice that Microsoft is calling 56-bit encryption "Strong", which is pretty outrageous. In the "Configure Settings" box, click Next. In the "Completing New Network Policy" box, click Finish. 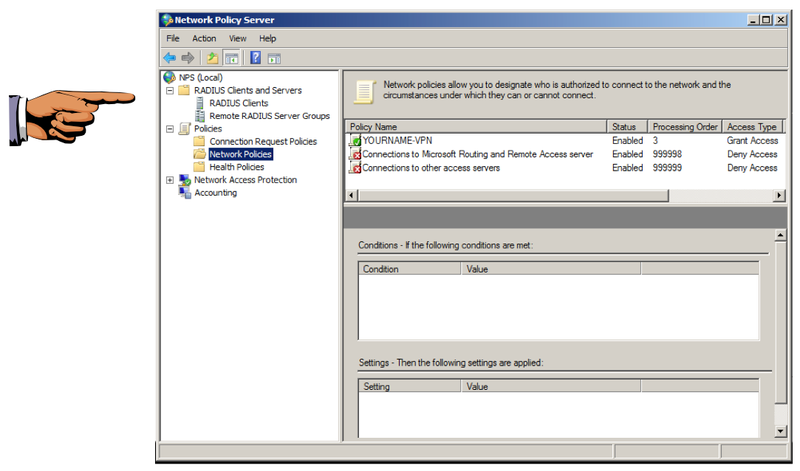 In the left pane of the "Network Policy Server" window, click "Network Policies". 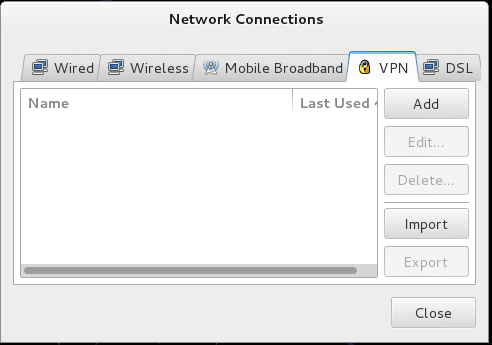 Make sure the YOURNAME-VPN item is visible, as shown above. Press the PrntScrn button to capture the whole desktop. Save a screen capture with a filename of "Proj 5xa from YOUR NAME". You need a password on your Windows Server 2008 account to use it with a VPN connection. If you have been using an account with no password, add a password to your account now. The instructions below assume you log in to your Windows Server 2008 machine as "Administrator" with a password of "P@ssw0rd", which is obviously insecure. This should not be necessary if you are using the Kali I handed out in class because I already did it. 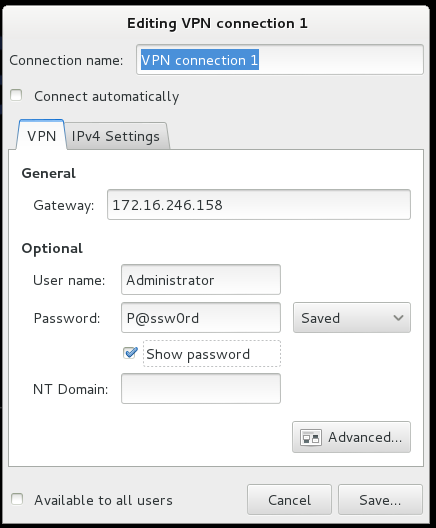 In the "Choose a VPN Connection Type", accept the default of "Point-to-Point Tunneling Protocol (PPTP)" and click Create. In the "PPTP Advanced Options" box, opens with PAP highlighted, as shown below. Press the SPACEBAR to uncheck PAP. Press the down-arrow key to select CHAP and press the SPACEBAR to uncheck it. Press the down-arrow key to select MSCHAP and press the SPACEBAR to uncheck it. Press the down-arrow key. Leave MSCHAPv2 checked. Press the down-arrow key to select EAP and press the SPACEBAR to uncheck it. 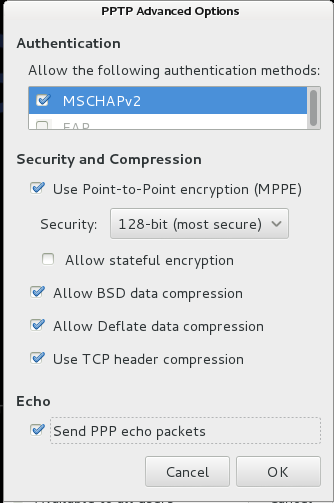 Click the "Use Point-to-Point encryption (MPPE)" box. In the Security drop-down list, select "128-bit (most secure)", as shown below. 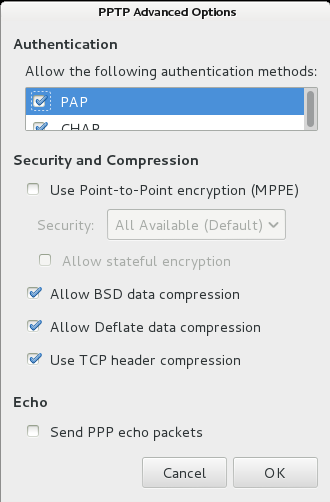 At the bottom of the PPTP Advanced Options box, click "Send PPP echo packets", as shown below. In the PPTP Advanced Options box, click OK. In the "Editing VPN connection 1" box, click Save. In the "Network Connections" box, click Close. A littie yellow dot moves around on the icon that shows two blue computer screens, and when it stops, the connection is made. On your Windows 2008 server, in "Server Manager", from the menu bar, click Action, Refresh. 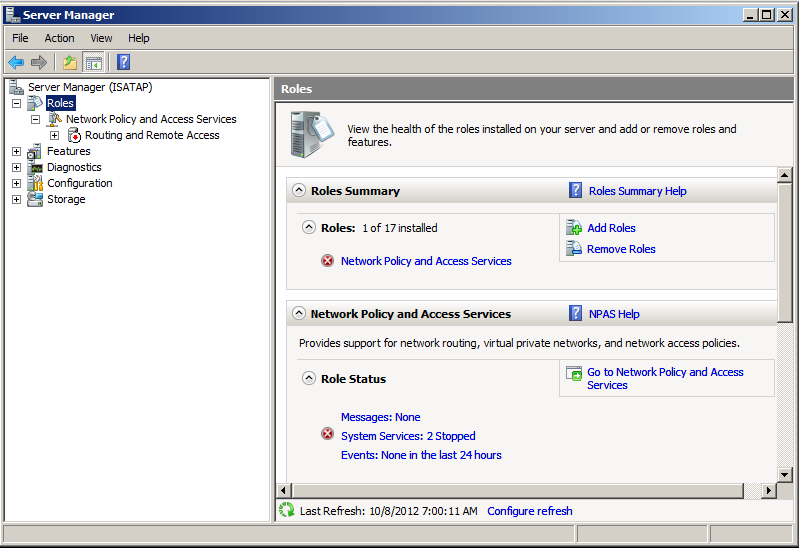 Make sure the left pane shows "Remote Access Clients (1)", as shown above. Save a screen capture with a filename of "Proj 5xb from YOUR NAME". Email the images to cnit.120@gmail.com with a subject of "Project 5x from YOUR NAME".